Ever get sick of having to write-down your Hero stats before every game of Middle-earth Strategy Battle Game? Annoyed with keeping tally’s with a pen and paper, or the set up of laying out all your dice on hand-written grids and/or widgets? Wish there was some sort of app that you could set up on your phone or tablet instead? Me too. It’s also super duper simple to knock something like that out, so I went and did it. Just open it in your browser on your laptop, phone, tablet or just about any device with a web browser. The Middle-earth SBG Hero Stats Tracker is a pretty simple premise. 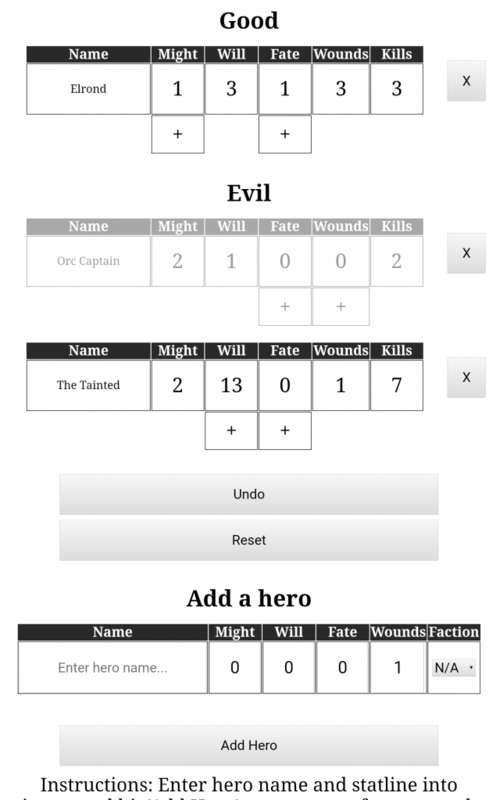 Fill in the form at the bottom of the page to add Hero’s to your list with a starting statline. Click or touch any of the stats to reduce them by 1. When a Hero runs out of Wounds, they’re removed from the tracker – it’s that simple. The Tracker will also persist your Hero’s stats between sessions and/or if you close or refresh the window accidentally, and there’s even an undo button for fixing any mis-clicks you might have made! Any comments/criticisms/feature requests, please feel free to drop a comment on this post. Hopefully you find it useful, and thank’s for checking it out. NOW GO PLAY WITH IT.